Plot: A travelling circus magician is caught in a tornado and thrust into the mysterious land of Oz, where he must assist the good people to defeat a Wicked Witch who reigns over the land. It has undeniable flaws but it is still a fun, magical romp through the wonderful land of Oz for today’s kids – even if it is likely they will still prefer Dorothy’s adventure. Since L. Frank Baum first introduced us to the world of Oz in his series of children’s’ books in the 1900s his stories have become a staple on the silver screen, from an early silent version in 1910 to the bizarre and eerie Return to Oz in 1985. This has led on to the magical, popular west end theatre show Wicked but it was of course only a matter of time before Hollywood revisited Oz once more, this time in the form of Sam Raimi’s Oz: The Great and Powerful. There is little doubt that fans will make comparisons mainly with MGM’s 1939 musical The Wizard of Oz: a film that is proof enough that everyone loves a timeless classic. Imaginative characters and a fairy tale battle between good and evil immersed within a glorious technicolour setting of a world ‘somewhere over the rainbow.’ However does Raimi’s film stand up to its predecessor as a worthy and fitting prequel? Oscar Riggs (James Franco) is a failing magician in a travelling circus in Kansas. One day after a particularly disastrous act, he finds himself whirled away in his hot air balloon through a relentless tornado until eventually the mist clears and he lands with a bump in the mysterious land of Oz. In awe of his surroundings, he soon comes across beautiful witch Theodora the Good (Mila Kunis) whom he immediately woos with his token cheesy lines. Falling for him, she believes him to be the prophesised saviour of Oz who will defeat the Wicked Witch of the East who is spreading evil through the land and so leads him off towards the Emerald City to face his fate. He happily accepts with the promise of great riches but soon realises he may have taken on more than he can handle while armed with only cheap tricks and no magical powers. There has been speculation over the casting of Franco in the role of Oz. While the casting could have undoubtedly have been better, Franco is actually pleasantly passable as the womaniser and ‘master of trickery,’ possessing a certain sassy quality with his goofy grin that is hard not to like. 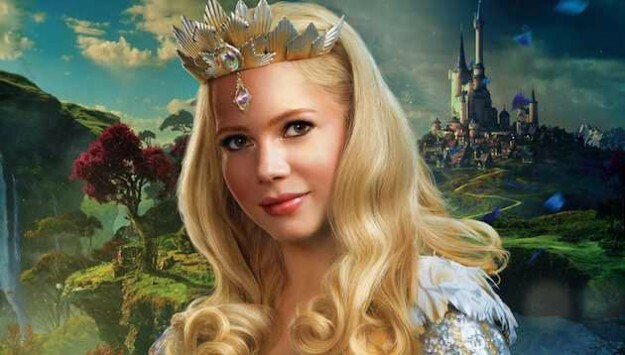 Williams portrays the flawless Glinda the Good with great poise and control, but with the character always having an overwhelming sense of good emanating around her, Williams’ melodramatic style becomes a little too much as the film progresses. Weisz carries the character of Theodora’s sister, Evanora with ease, coming across as a kind of fairy tale wicked stepmother. After years of watching the Wizard of Oz, we all have in our minds what the Wicked Witch of the East may be like and Weisz does not disappoint, despite lacking those famous red and white striped tights and glittering ruby slippers. A significant casting mistake seems to come in the form of Mila Kunis as the iconic Wicked Witch of the West. We are faced with how the stunning, headstrong Theodora transformed into this terrifying, green hag, under the unlikely premise of ‘a woman scorned.’ Kunis just does not possess the believable, simplistic, sinister qualities of Margaret Hamilton as the Wicked Witch. Although we do hear her token cackle, gone is Hamilton’s terrifying, screeching voice in favour of, well, Kunis’ own normal voice – but shouting. She sounds more like an infuriated teenage girl as opposed to the embodiment of evil, so much so you are almost waiting for the sound of a slamming bedroom door afterwards. Oz: The Great and Powerful refers to Baum’s original stories rather than the MGM musical and Disney were actually restricted as to what references they could make to the Wizard of Oz. We may not see the iconic ruby slippers or have longer musical numbers by Munchkins (although they do briefly appear), but there are subtle references there. There is an appearance from a cowardly lion, a freaky band of flying monkeys serving as the Wicked Witch’s minions, some scarecrows (mechanical in this instance) and an array of characters in colourful Oz who represent those from the ‘real’ black and white world world: Oscar’s assistant is now feisty, loyal little flying monkey, Finley (Zach Braff) and a sweet, little china doll (Joey King) becomes the young girl who begged Oscar to work his magic on her legs to make her walk again. These characters are not essential to the story, but they do provide a reason for Oscar to redeem his lesser qualities and are clearly there to draw laughs and admiration from the kids. Unfortunately, this film does not possess the strongest plot. In particular it does need a more penetrating sense of evil to counteract the unyielding goodness of Glinda. However, what the film lacks in storyline, Raimi makes up for with some incredible visual effects, cinematography, music, costume and make-up. The opening credits are filled with swirling, kaleidoscopic animation reminiscent of Lemony Snicket’s A Series of Unfortunate Events, closely followed by some black and white scenes and then the colourful, CGI wonder of Oz itself, with a Tim Burton feel coming from an enchanting, snappy musical score by Danny Elfman. Oz: The Great and Powerful may displease some Wizard of Oz fans with its lack of nods to the classic and have some weak links in terms of casting and plot, but it will be interesting enough to see where Raimi heads to next with his characters. It has undeniable flaws but it is still a fun, magical romp through the wonderful land of Oz for today’s kids – even if it is likely they will still prefer Dorothy’s adventure. From the age of 4, Misha Wallace became transfixed by movies like Halloween and The Birds from behind the couch, unbeknownst to her family. This has developed in to an obsession with fantasy and horror films (and a considerable number of cheesy 80s and 90s flicks – but she will not be judged). If she was a character in a film she'd be the girl at the end of a horror movie, doused in blood but grinning victorious. Email: misha.wallace@filmjuice.com or find her any time of the day or night on FilmJuice social media.